Due to recent changes to the beach parking permit ordinance, the county is updating the current application. We feel that the new changes will make the application process a lot easier for our citizens and visitors. The newly designed 2019 application will be available by May 1, 2019. Please check back periodically since it may be done early and we will post the application as soon as it is completed. Vehicles parking on the Currituck North Beach. 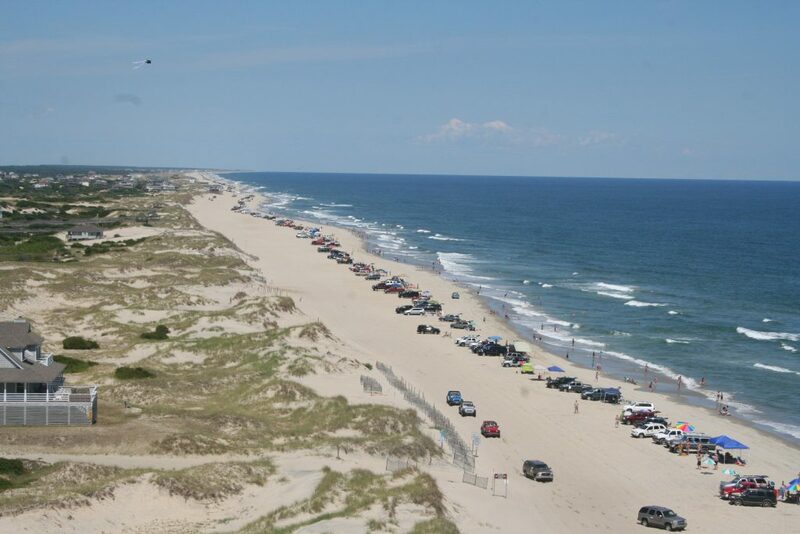 Beach goers who wish to park on Currituck County’s four-wheel drive beach during the summer are required to have a county-issued beach parking permit displayed on their motor vehicle. This permit system was adopted by the Board of Commissioners in 2018 as an effort to increase safety in the four-wheel drive area, where large numbers of people and vehicles mix on a daily basis during the summer tourist season. or hunters who are using state or federal land located within the Currituck Outer Banks. Air Down Ordinance – No person shall drive or operate a motor vehicle on the beach strand or foreshore with tires containing air pressure exceeding the following pounds per square inch (p.s.i. ): (1) Twenty p.s.i. for motor vehicles with curb weight of less than 5,000 pounds; (2) Tire p.s.i. not greater than that required for safe travel for motor vehicles with curb weight greater than 5,000 pounds. Air Down Location – Motorists should pull over to air down tires at the Corolla Village Road public access facility, which is located on the east side of N.C. 12. Air Up Location – After leaving the beach, motorists may air up tires at Historic Corolla Park, which is located on the west side of N.C. 12. Enter at main park entrance and turn right into parking lot. Air stations are located at the end of the lot near the picnic pavilion. Beach Driving Lane Shift to Dune Line – From the Friday before Memorial Day to Labor Day, between the hours of 9:00 a.m. and 5:00 p.m., the beach traffic lane will shift from the foreshore to a lane adjacent to the dune line only in the area 1.5 miles north of the beach access ramp to Mile Post 17. Do Not Block the Traffic Lane – All vehicles shall be parked in the middle of the beach strand and not obstruct the traffic lane. Likewise, no beach chairs, coolers, fishing lines, or other items should be placed in a location that blocks the traffic lanes. Remove Your Stuff When You Leave – Visitors should not leave any unattended property on the beach. Any property remaining on the beach between sunset and sunrise shall be considered litter and is subject to removal and disposal. Fill Your Holes – Excessive and unsafe digging or piling of sand on the beach is prohibited. Visitors must fill in any holes dug while playing on the beach to prevent safety hazards for those traveling on the beach. Help Preserve the Dunes – Remember that it is illegal to walk on or traverse the dunes outside of a defined dune walkover beach access point. Do not allow children or pets to play or dig on the dunes, and do not damage or remove any dune vegetation. Do Not Litter – Please remove all trash when you leave and help keep the Currituck Outer Banks beautiful for everyone. You are more than welcome to enjoy our northern beaches via 4WD vehicle. Driving on the Corolla beach is a unique experience and requires drivers to take many safety measures. You can download our PDF brochure on beach driving here. All vehicles to be driven on the beach and roads behind the dunes must be registered, properly licensed, and insured. If your vehicle is not equipped with 4WD, do not attempt to drive on the beach. Fill your gas tank before driving onto the beach. There are no gas stations located in the four-wheel drive area. Do not stop or park in the Corolla beach ramp area. Use 4WD onto the ramp and maintain a slow, steady speed, watching for pedestrians at all times. 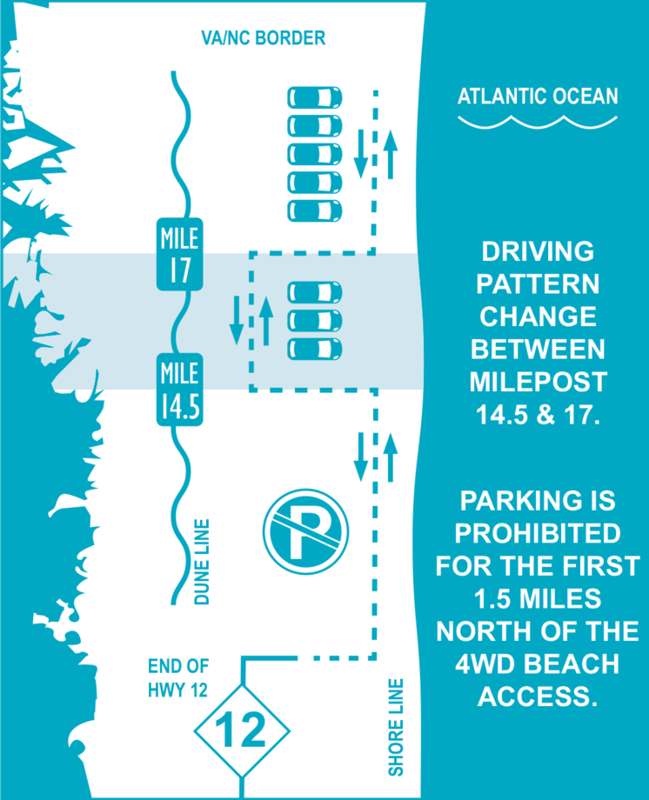 Once on the beach, there is no parking until you reach mile post 14 (approximately 1 mile). Do not stop until you are clear of all posted no parking/stopping zones, on narrow sections of the beach; Continue driving to an area where the beach is wide enough to allow other travelers to pass, both at the water’s edge and at the dune line. The speed limit on the beaches of Corolla is 35 mph. On the shore or beach strand, the speed limit is 15 mph when traveling within 300 feet of any person or animal. When approaching another vehicle, use your turn signal to indicate on which side you plan to pass. (It is customary to pass on the right, when practical). The other vehicle should respond with a corresponding signal. Parking correctly on the beach is critical for the safety of people and pets. Always keep your vehicle and personal property such as chairs, beach umbrellas, etc. centered and between the waterline and the dune line. This may involve moving vehicles and belongings with the tide change. The beach is a State recognized “road” or Public Vehicular Area (PVA). The shoreline (next to the water’s edge) and dune traffic lane (those deeply rutted tracks next to the dunes) are designated Fire, Emergency, and Vehicular traffic lanes. The law requires that individuals fill all ruts and holes and level any sand structures they have created. Parking or setting up beach equipment is not permitted in these lanes. Do not impede traffic by stopping, setting up beach chairs, digging holes, or building sand structures in the designated traffic lanes. Vehicles parked on the beaches of Corolla must be parked in the area east of the dune line and west of the hard packed sand strip, adjacent to the water’s edge. No chairs, coolers, fishing lines, holes, trenches, or any other items are permitted to block the foreshore. This would restrict vehicular movement in a north-south direction along the dune line or along the water’s edge. Remember to WATCH FOR PEDESTRIANS! The loud sound of the surf can make it difficult for people to hear approaching vehicles. In addition, children are often distracted and dart in front of cars. As a driver, it is your responsibility to stay alert. As a pedestrian, it is your responsibility to not impede traffic. Watch for wild horses while driving on the beach, especially at night. The horses roam the beach freely and many of them are dark in color, making them hard to spot at night. Be aware of the tides when beach driving in Corolla. The beach road becomes very narrow at high tide and people have been known to lose their cars if they aren’t careful! As always, don’t drink and drive. Each year, thousands of visitors enjoy the beaches of the Currituck Outer Banks. To ensure this natural environment is maintained – and that visitors are protected as well – Currituck County has established ordinances and laws. Parking – No vehicle of any type may park or unload at the North Beach Access at any time. This must be done on the beach past the 1/2 mile mark. VIOLATORS SHALL BE TOWED. Operators must be 16 years of age and possess a valid driver’s license. Overnight parking against or on the dunes is illegal. Reckless Driving – Driving a vehicle in a repeated circular motion – doing “donuts” – or driving in the surf are examples of careless and reckless driving. Reckless driving and other traffic offenses are violations of North Carolina Motor Vehicle laws. The beach and the sand roads behind the dunes are Public Vehicular Areas, and these laws are enforced. Dunes – Walking or driving a vehicle on the North Beach dunes is prohibited. Wild Horses – While on the northern Outer Banks beaches, you may come in contact with our famous Colonial Spanish Mustangs. Keep in mind, they are wild – do not approach them. IT IS AGAINST THE LAW TO GET CLOSER THAN 50 FEET OR TO FEED THEM. Feed them can (and has been) fatal. Please view the horses from a respectable distance and encourage others to do the same. If you observe an injured horse, please call the Corolla Wild Horse Fund at 252-453-8002. Pets – Currituck County has a county-wide leash law. Your pet must be on a leash at all times. And remember; please clean up after your pet! Restrooms – There are no public restrooms on the northern Currituck beaches. Public urination is prohibited in Currituck County. Littering – Please help keep our beaches clean by removing all trash from the beach when you leave. Bonfires – Open-burning, including bonfires on the beach, is prohibited. This includes the dunes and the subdivisions/areas behind the dunes. Also, glass is not permitted on any of the Currituck beaches. Beach Camping – Overnight camping on the beach is prohibited. All Terrain Vehicles (ATVs) – ATVs are no longer allowed on the beaches of Currituck County for non-residents. Personal Watercraft (Jet Skis) – Launching of personal watercraft is prohibited on the Atlantic Ocean side of Currituck County, but you may enjoy your personal watercraft in the Currituck Sound. Public ramps are located at the Whalehead Club. Fireworks – Fireworks that are self-propelled, spin, or explode are illegal in North Carolina. This State regulation is enforced on the Currituck beach and behind the dunes. Fireworks, including those that are legal, are extremely hazardous because of dry beach grasses, closely-built wood structures, high winds, and other factors. Swimming – A red flag on the beach indicates that ocean conditions are not safe for swimming. All forms of water activity are prohibited. Any entry into the water when red flags are flying shall be a misdemeanor punishable by fine of not more than $500 or not more than 30 days imprisonment. Surfboards at least five feet in length and equipped with a leash are exempted. If you observe others violating the law, please call the Currituck County Sheriff’s Office at 252-232-2216. The Carova Beach Volunteer Fire Department is located at 2169 Ocean Pearl Road. To get to the station from the beach, turn at the ramp located between the 21 and 22 mile markers. The ramp has a Fire House sign marking the turn. The Fire Station is not staffed at all times but does provide local response to 9-1-1 calls 24 hours a day, 7 days a week. Many people and animals live on the North Beach. The dunes and property behind them are privately owned. Please restrict driving to the traveled roads. The laws of the beach are enforceable in this area as well. House numbers (addresses) behind the dunes correspond with the beach mile markers. The Carova Beach Volunteer Fire & Rescue Auxiliary sells T-shirts, ice, and cold drinks at the station, Wednesday through Sunday from 12 to 2 p.m. throughout the summer season. An outside pay telephone is available at the Carova Beach Fire Station. Save on Spring & Summer OBX Vacations! Save Up To $500 on Spring Weeks! Save $200 on select July weeks! Visit Currituck & Get MORE! ©2019 Currituck County, NC. Currituck County Department of Travel and Tourism.